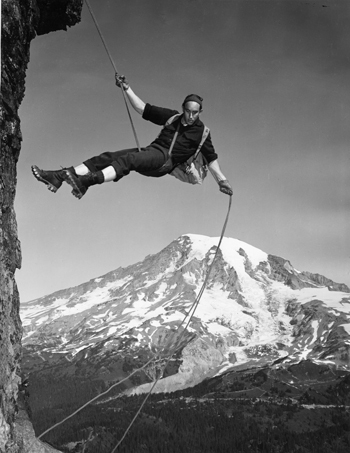 A Mountaineer Rappels, Photographs, General Subjects Photograph Collection, 1845-2005, Washington State Archives, Digital Archives, http://www.digitalarchives.wa.gov. This amazing photo shows Walter Gonnason (ca. 1950), explorer and mountaineer, rappelling from Pinnacle Peak with Mt. Rainer framed perfectly in the background. Gonnason, a Seattle native, made many expeditions to peaks and glaciers around North America. He also played a small role in a long-fought controversy over the credibility of one of America’s most famous explorers. Highway Map of Washington, Record Series, Map Records, General Map Collection, 1851-2005, Washington State Archives, Digital Archives, http://www.digitalarchives.wa.gov. Much has changed since the Federal Aid Highway Act of 1956, which created the interstate highway system. Before then, drivers made do with smaller roads, many of which still exist today with different names. Highways, exploding in size following the decline of passenger train travel, had the ability to make or break towns and cities. The above image shows the highways of Washington c. 1927. Note the lack of the now ubiquitous I-5 and I-90 corridors. It is hard to imagine Washington today without them. Yet this snapshot is preserved in the digital archives. 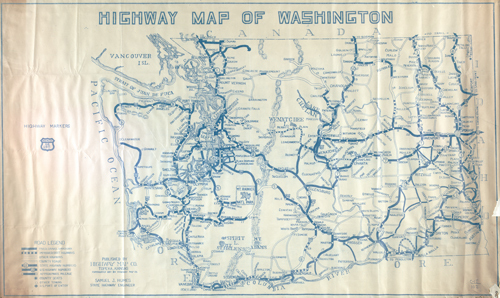 The Washington State Archives has a large collection of highway maps. Search “highways” on the Digital Archives main page to find more. 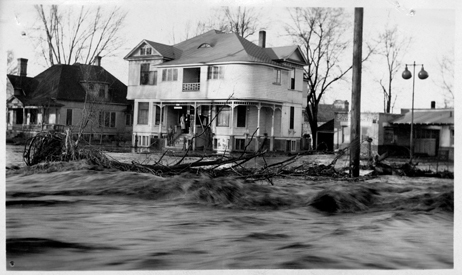 Flood Waters Rising in Residential Area of Walla Walla, Walla Walla Flood Control Commission Photographs, 1931, Washington State Archives, Digital Archives, http://www.digitalarchives.wa.gov. For three harrowing days in 1931, Walla Walla’s streets turned into rivers, alleys into streams, and curbs into waterfalls. The image above is one of a series of photos taken by the Walla Walla Flood Control Commission and collected by the Washington State Archives. The flood began on March 31st and was caused by nearby Mill Creek overflowing into the city. It damaged roads, bridges and many automobiles. Damage was estimated at around one million dollars. Mercifully, only one fatality was reported. Following the disaster, the Army Corps of Engineers dammed Mill Creek, preventing future flooding. The Walla Walla Flood Control Commission Collection is a testament to the power of nature and a reminder to always be vigilant. The Digital Archives and Eastern Region Branch of the Washington State Archives will celebrate Archives Month with an open house event on Saturday, October 26, 2013. This year’s theme, Hearing History: Preserving Washington Voices, highlights the preservation of Washington oral histories in collections such as Women in the Washington State Legislature and Spokane Voices of the Pioneers. The event will start at 9:30 am with a two-hour genealogical workshop (limited seating is available, so contact the branch at 509-235-7508 to reserve a spot). At 11:30 the archives will open to the general public. Dr. Laura Phillips, historian and professor of history at Eastern Washington University, will conduct one-hour oral history workshops at 11:45, 1:00, and 2:30. Archives staff will offer guided tours of the Digital Archives and the Eastern Region Branch throughout the day as well. Don’t miss this opportunity to see how Washington State Archives serves the citizens of Washington every day! 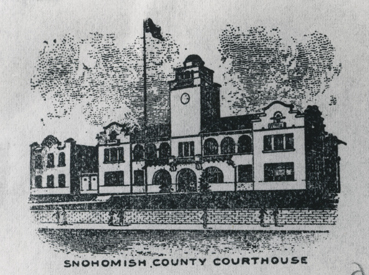 Photograph of a drawing of the Snohomish County Courthouse ca. 1920, artist unknown, General Subjects Photograph Collection, 1845-2005, Washington State Archives, Digital Archives, http://www.digitalarchives.wa.gov. Over 14 million new Snohomish County superior court case files are now available through the Digital Archives. The Snohomish County Clerk transferred the records to the Digital Archives the first week of March, and staff spent the rest of the month processing them. This massive effort enabled them to publish the cases (14,598,722 in all) to the website on August 20, 2013. Users can search the records by case number, keyword, and case year. Ray Bishop Sea-Tac Scrapbook, page 28, Record Series, Photographs, Seattle, Port of, Ray Bishop Sea-Tac Scrapbook, 1942-1976, Washington State Archives, Digital Archives, http://www.digitalarchives.wa.gov. A new acquisition to the Washington State Digital Archives is the Ray Bishop Sea-Tac Scrapbook Collection. 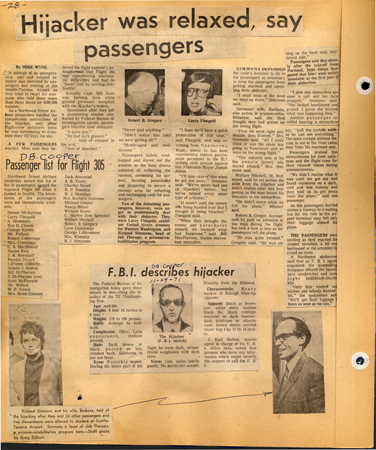 The scrapbook, created by an engineer who worked on the Sea-Tac project in the 1960 and 70s, contains photographs, newspaper clippings, project plans, and more, including a fascinating series of articles about one of Washington’s most infamous criminals. Big news at the Washington State Archives! In an effort to expand public access to our rapidly growing collection and to draft some of our users as honorary archivists, we have launched Scribe, a digital tool for adding metadata to our collections. Metadata is what helps users find digital records. When you search our marriage records for “Smith” for example, the search tool goes through and pulls those for brides and grooms named Smith. That metadata was largely entered by hand, by employees and volunteers at the Washington State Archives reading documents one at a time and adding names, dates, and other data into a spreadsheet. Scribe opens up this process to the world. Check out this introductory tutorial video, then click on this link to get started. 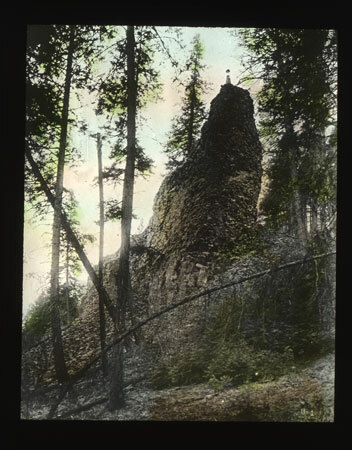 Woman on top of Basalt/Frank Palmer, Photographs, Spokane City Parks, Lantern Slides, 1900-1930, Washington State Archives, Digital Archives, http://www.digitalarchives.wa.gov. This image of a woman standing proud atop a basalt cliff at Downriver Park is part of a series of images from the 1910s to the 1930s highlighting the natural beauty of Spokane’s parks. Junko Shigio, Record Series, Miscellaneous Family History, Public Welfare/Social Security Department, (Japanese Internment) Assistance Cases, Evacuee Referrals for Resettlement and Assistance, 1945-1946, Washington State Archives, Digital Archives, http://www.digitalarchives.wa.gov. In 1942, four-year-old Washington resident Junko Shigio was considered a threat to national security and sent with her family to the Minidoka War Relocation Center in Idaho for the duration of the Second World War. Executive Order 9066, signed by President Roosevelt on February 19th 1942, authorized the rounding up of all persons of Japanese ancestry living along the west coast of the United States. Throughout California, Oregon, and Washington State, Japanese Americans were given days or sometimes mere hours to prepare for their long-term stay in the camps. Some did not pack warm clothing for the Idaho winters, or even have time to secure the personal property they left behind. 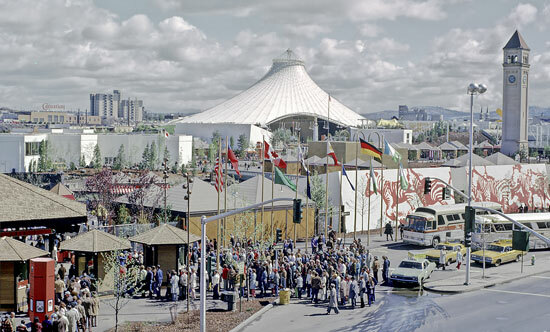 In 1974, Spokane became the smallest city to ever host a World's Fair. The community used the opportunity to re-vitalize the depressed downtown district. The Great Northern Railroad Depot, which had occupied the centrally located Havermale Island for the better part of a century, was torn down. In its place, Spokanites erected many buildings and planned outdoor spaces, the seeds of which would later become Riverfront Park. 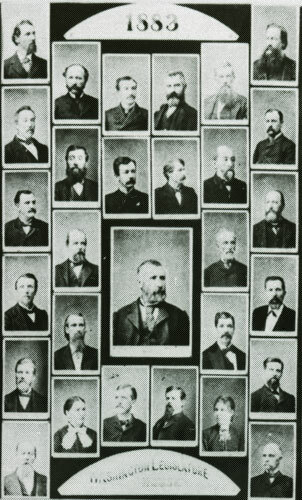 Looking through the House of Representatives Group Photos, 1883-1981 collection, one might notice the curious presence of women in the 1883, 1885, and 1887 photos of the territorial house legislature. Were there women legislators in the territorial period? This photo is from the City of Spokane Public Works Department, and harkens back to a time when horses and carriages still reigned supreme in the City of Spokane. 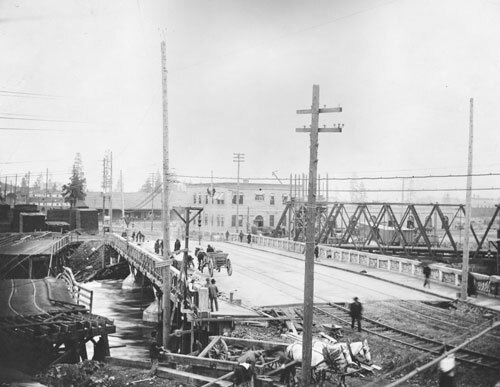 In 1908, the Washington Street Bridge was constructed over the Spokane River to provide an avenue for the rapidly growing city’s population. Meet William Hoppy. Born in November 1903, Hoppy was convicted of Grand Larceny and sentenced to 2-15 years in the State Reformatory. Hoppy was 25 years old at the time of sentencing and worked in Grays Harbor as a hoist, or crane, engineer. In the metadata on his page at the archives, we also see that he was not a Washington native, but was born in Missouri. The Washington State Parole Board released Hoppy a little less than two years into his sentence, which apparently was a mistake, as a search on the archives main page for “William Hoppy” shows he was arrested again in 1930. By then, Hoppy had moved from Grays Harbor to Yakima, and was charged with Burglary. For William Hoppy, reform did not take. 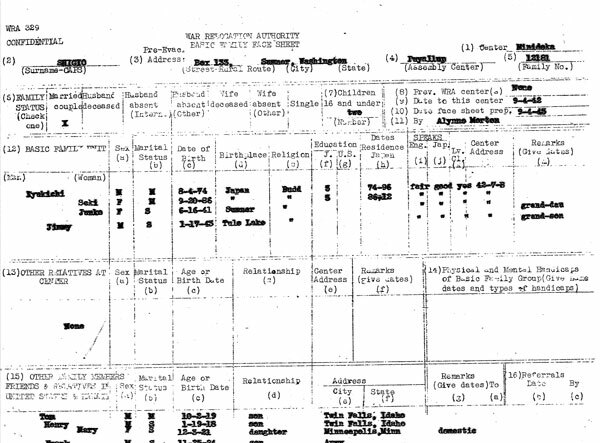 The Corrections Department, Reformatory, Admissions Registers, 1908-1923 contains many stories about individuals such as Hoppy. These criminal records, in many cases, provide a glimpse into the lives of citizens and family members from the past. They are perfect for research and general interest. Do your own search today. Grandpa may surprise you! State Seal, Secretary of State, Corporations Division, Trademarks, 1895, Office of the Secretary of State, Washington State Archives, Digital Archives, http://www.digitalarchives.wa.gov, accessed 2/4/2013. The Digital Archives recently added Trademark Records to its online collections thanks to the efforts of the Corporations Division of the Office of the Secretary of State. A trademark, according to the United States Patent and Trademark Office, is a brand name, unique word, name, symbol, device, or any combination that identifies and distinguishes a product or service from other products or services. 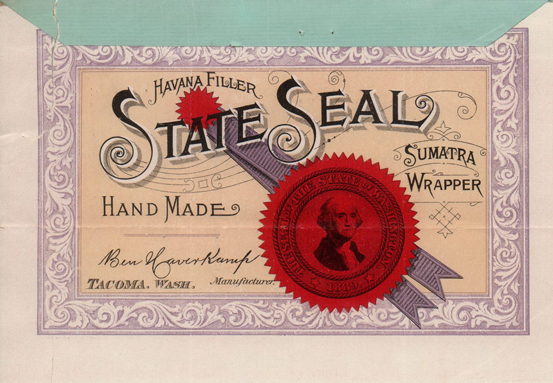 The records include applications and samples of the trademark like the image included above for State Seal Cigars manufactured in Tacoma, Washington. 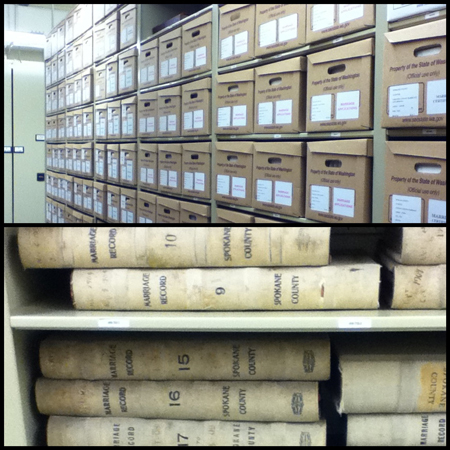 Other documents in this collection include reservations, assignments, amendments, and renewals. Hotel magnate Louis Davenport was a seminal figure in early Spokane’s history. This photo, shows the man himself leading a group of businessmen up the Mt. Spokane Toll road to the summit. The road was constructed by Spokan Times publisher Francis H. Cook. After losing his initial fortune during the crash of 1893, Cook sold his farmlands to buy a tract of land leading to the summit. Working long hours by hand with the help of his son Silas, he constructed a road all the way up the mountainside. In 1920, Cook put the land under the control of Davenport and died soon after. 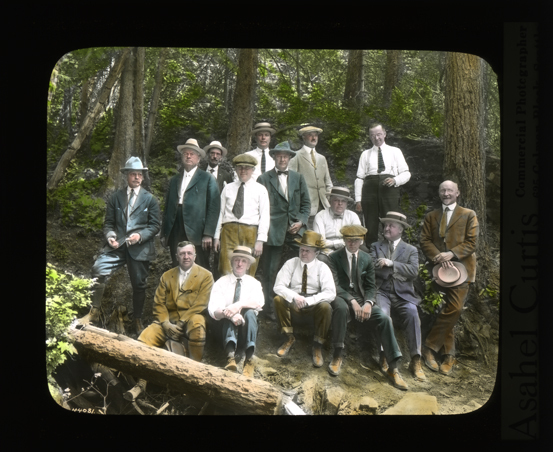 The photo above shows a group of businessmen looking to make improvements to the mountain. In 1927, the land was given over to the protection of the Washington State Parks Commission, and became part of the first state park in Eastern Washington. Do a search for “Davenport” on the Washington State Archives Main Page to find much more about the man and his legacy.